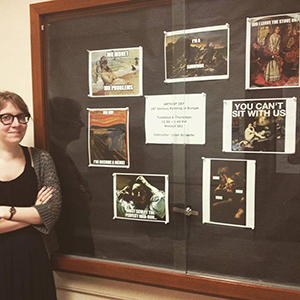 Visiting Assistant Professor Sarah Schaefer creates bulletin board advertisement for ARTHIST 357: 19th Century Painting in Europe. Assistant Professor of English and Film, Jocelyn Szczepaniak-Gillece, was featured on ten successive Canadian NPR stations to discuss Stars Wars and special effects. On Friday, December 4, 2015, Linda Brazeau, Director of the UWM Art Collection and Galleries, Christa Story, Curator of the UWM Art Collection and Galleries, and Jackie Murphy, Fall 2015 UWM Art History Gallery Graduate Intern, traveled to Edgewood College in Madison, WI for Fall 2015 Curator’s Conversations. On Tuesday, November 10, 2015, the UWM Art History Gallery hosted Art Exposé. 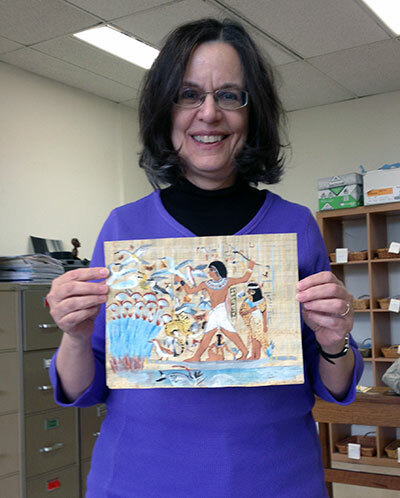 “Nebamun Hunting Birds” was beautifully recreated by undergraduate students, Rachel Kreiter and Molly Meier, as their experiential art project for ARTHIST 315: Art and Archaeology of Ancient Egypt class. Harry Bertoia’s Untitled, ca. 1960 demonstrates his fascination with tonal structures.